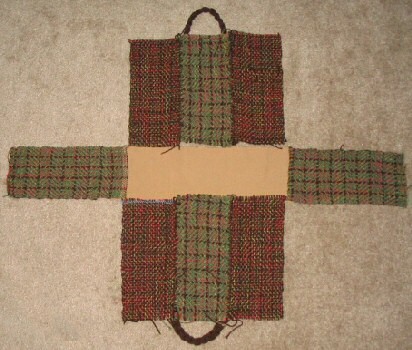 The challenge has been “What do I do with all my handwoven sample strips.“ I presented an idea in my last post, and I completed it over the weekend. In contemplating the suggestions from the comments for this post, I was able to work though several things I had questions about. My first question was about the bottom. I had vaguely thought to simply use one of my handwoven strips for the bottom, but Valerie’s suggestion to use commercial fabric made more sense as it addressed a couple of things: waste (as in, who’s going to see the bottom anyway), and wear (as in, why wear out handwoven fabric when commercial fabric will do), not to mention possibly getting the bottom of the bag dirty. First I braided the i-cord. It took about 7 yards for a two yard braid. I really liked Tricia’s idea of fulled i-cord, as it would have prevented any stretching of the handle. But since I wasn’t working with wool, I’ll have to save this suggestion for another time. 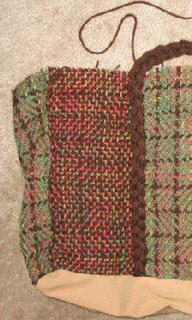 The handwoven side panels were whip stitched together and the i-cord was stitched to the outside in the same manner. Next, the end panels were placed wrong side together with the sides. I used a running stitch to sew them together, leaving the selvedges exposed on the outside of the bag to make a nice edge. Lastly, I sewed the bottom panel on by hand. Another problem I had contemplated was that I didn’t want the bag to have a soft, droopy bottom. Initially I had wondered about putting cardboard in the bottom, but Charleen came through with the suggestion to use plastic canvas. Perfect! I tucked the plastic in under the seam allowance around the bottom. This took care of the possibility of the corners of the plastic poking through my handwoven fabric. I tacked it down in a couple of places to prevent slippage. The result was a beautiful, firm bottom to the bag. 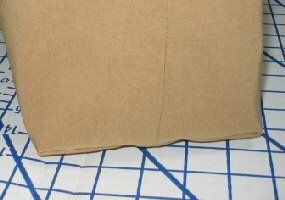 I made the lining from a simple rectangle of the same fabric I used for the bottom. After sewing up the side seams I measured for the corner seams. Using a ruler to keep the liner’s side seam centered, I measured and marked a line as long as the bag’s width. I sewed the lining to the bag with right sides together, leaving an opening on one end. I pulled the bag right side out and hand stitched the opening closed. I added a couple of reinforcing stitches for the hand straps and that was it! My plan is to use this for my Winter Knitting Project. 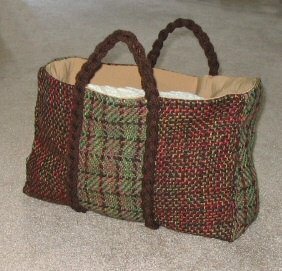 I love to use baskets for yarns and knitting, but find that they are often awkward to transport. So this bag will be used for that. I think that will make a good knitting bag - baskets are lovely, but they are so awkward to get around with. 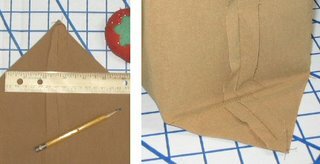 Plastic canvas is a very clever solution to the droopy bottom syndrome - I find that using cardboard, all you need is a little moisture where you put it down, and suddenly, you are carrying a quasimodo bag! INSPIRATIONAL!!! Thanks for posting! And the plastic canvas idea will keep me from having to trash a purse I love, that is just sloppy with no bones. I love the bag. I agree that sampling is good all on its own, but how cool that you can turn them into something beautiful and useful too. I used to use cardboard too, but when I made the Fibertrends Birdhouses they suggested plastic canvas for a stabilizer and I realized how good it would be for bags. What I usually do is make a sleeve for the canvas and it sits on the bottom as a separate piece. Don't know why except that it was probably in the instructions with the first bag I made. Now I have two ways of doing it! Wonderful bag!!! and it's all your Idea thats even bertter. A great way to use and display your samples. By the way LOVE that kitty I have nine, two live in the house most of the time. I have a Zeek who loves to sit on my desk or what ever I am looking at or working on. About the nine cats most were rescue, some are a full litter they have all been nutered or spayed. That is a slick bag, I must say. Kudos to you for your resourcefulness and for making a cool-anyone-would-be-proud-to-carry-it bag. By the way, would you be interested in some Galway Cross fleece from Ireland for your rare breeds project? Not sure how 'rare' it is though. Fairly common here.